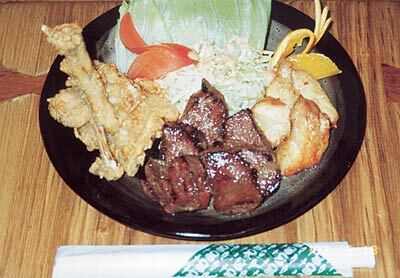 Okinawan restaurant chain Karin offers a mix of both exotic and traditional foods at each of their three restaurants. This chain first opened three years ago with their restaurant in Okinawa City, while the latest one made its debut in Mihama last October. There are two Karin restaurants in Mihama; both are located on the second floor of the building with the giant Ferris wheel towering over it. The branch I went to was close to the escalator and to the Thai restaurant. While flipping through the menu, I saw many traditional things you’d find at most Japanese-style restaurants: donburi, udon, soba, zenzai, awamori, Orion draft beer. Then I saw it. Alligator! Ostrich! Frog! Whoa! By now I was used to trying a few new things on my regular restaurant review outings, but I was freaked out, to say the least, by the idea of eating large, mean, green reptiles or gigantic birds that day. I wanted beef but got “Animal Kingdom” instead. As I said, being a picky eater I was extremely intimidated by the idea of eating frog and alligator meat, but after closing my eyes and forcing a bite of each, I was impressed. Alligator has a firm, juicy texture like beef, and a similar taste as well. The frog was the best! The meat tasted like chicken but had more of a fishlike texture than chicken meat. Ostrich was also pleasant tasting, more or less like a small roast beef fillet. There was nothing to fear but my own inhibitions. After sampling these two dishes, bowls of teriyaki chicken donburi and steak donburi were brought out. The restaurant serves very large portions, and the meals were delicious. For only ¥500 a bowl, the donburi was a steal. The restaurant currently offers 20 types of donburi (a meal of rice with some sort of topping, such as beef, chicken, pork, fish or eggs, often with a savory sauce and always served in a big bowl) for ¥500 each and a variety of soba and udon. Everything on the menu is low priced. Fresh draft beer is only ¥300, Orion draft is ¥400, Corona and Zima are ¥500, awamori is ¥400 per glass or ¥2,000 per bottle, wine is ¥400 per glass and soft drinks are all ¥300. 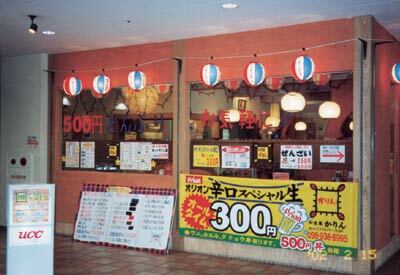 There are many set meals such as fried chicken, boiled mackerel, cuttlefish, and tofu and veggies, all for ¥800. And for the next two weeks, if your order exceeds ¥1,000, you’ll get one free Ferris-wheel ticket courtesy of the restaurant. Dollars are accepted at Karin, and the menu is bilingual. One of the staff members also speaks English very well, and the owner says that when the place becomes more popular with the American crowd, he will bring in more bilingual staff. The restaurant is currently advertised on TV and the radio, so it has been gaining in popularity with both Americans and Japanese. With traditional Japanese meals and some non-traditional dishes, for whatever you are craving Karin is well worth your while. If you’d like to hold a party at Karin, the restaurant takes reservations for functions of up to 40 people. Call 098-936-8995 for more information.